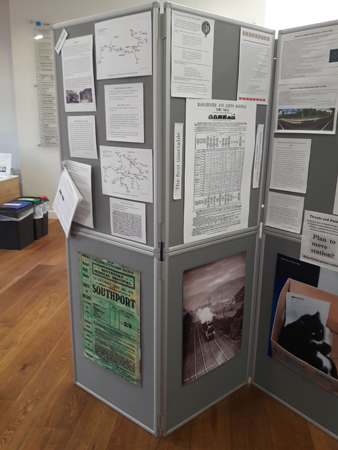 Thanks to a grant from Hebden Royd Town Council and the assistance of Hebden Bridge Local History Society, the Friends were able to mount an exhibition in Hebden Bridge Town Hall during March 2019. Extensive research has been carried out and it may be possible to add some of this to the history section of the website. The Friends also displayed in the library a selection from the library's collection of newspaper cuttings on the theme of Hebden Bridge Railway Station. 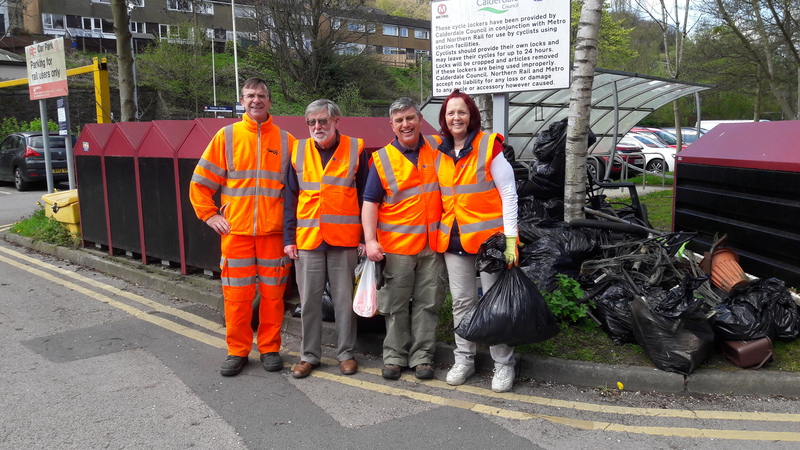 The Friends had a really good afternoon collecting litter from the Station surrounds and beyond. We filled many sacks, more than in this photograph. Hopefully everything looks much tidier now. 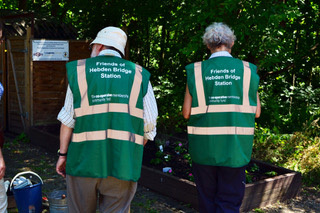 Making our station accessible by installing lifts has been an aim of the Friends of Hebden Bridge Station since our formation in 2007. After much hard work and dogged persistence, we have finally achieved this aim because on 18 March at 11:38 am the lifts took their first passengers. Thank you to all the commuters who gave us donations. 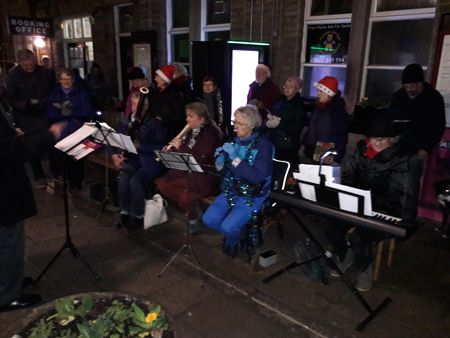 Thank you to all those who turned up to sing or play. 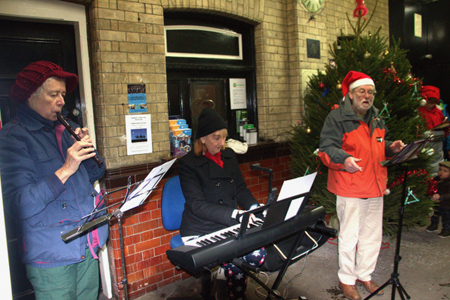 We had four musicians playing keyboard, bassoon, treble recorder and descant recorder.Thanks to David Storr who organised the event and tried to keep us together - a difficult task when there was a noisy train stopped at the station. The new signalling system along the Calder Valley means that the signal box at Hebden Bridge is redundant. 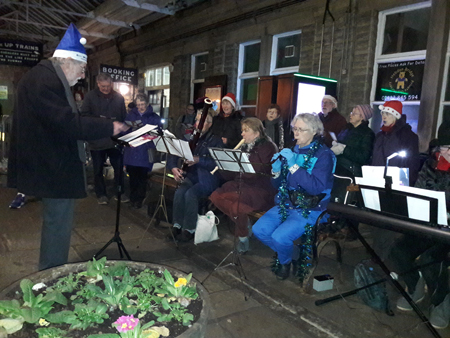 On the night of Friday 19th October, Paul Kenny, signalman, worked the last shift in the box accompanied by local operations manager, Derek King, and some of the Friends of Hebden Bridge Station. 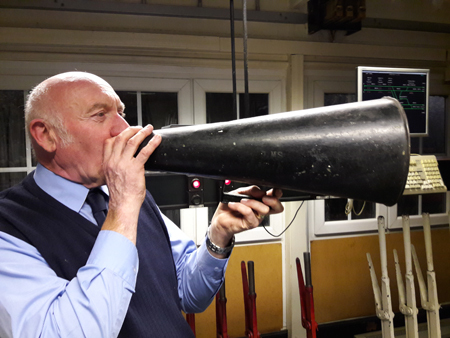 He demonstrated the LMS loud-hailer once used to communicate with the station, pushed the button which still rang a bell in the station and regaled everyone with tales of the railway cats, night traffic and nocturnal hedgehogs. 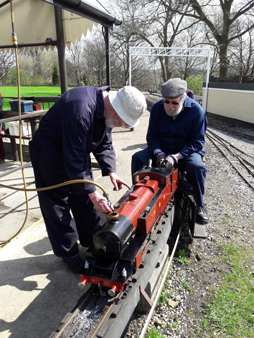 It was his last shift before retiring as well as the last use of the signal box, so a presentation was made to Paul by Derek King. Plans are under way for the Grade II listed signal box at Hebden Bridge to be taken into community ownership. This leaflet explains how we hope to save our signal box. Saving our signal box. Sam Whates is making a UK tour of Northern waiting rooms. Here is what was recorded in Hebden Bridge to give you a feel for what she and Northern wants to achieve. Film Sam will be presenting her project to bring music to unusual places at a community rail conference in September. We are extremely lucky to have a fantastic young musician involved with community groups across Northern's network, bringing people closer to the network. 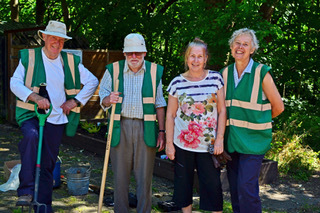 On 30th June, seven Friends turned up for gardening. 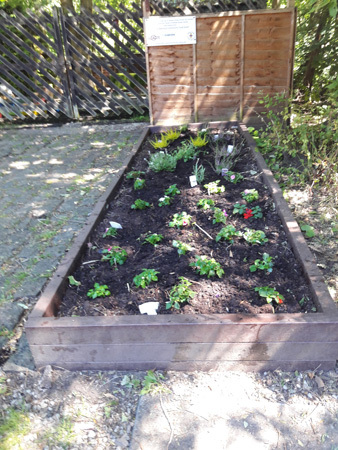 As well as watering and weeding, a small flower bed was planted out. With all the dry weather, the plants had to be watered frequently. Now the rain has arrived, the slugs and snails have found the flower bed. 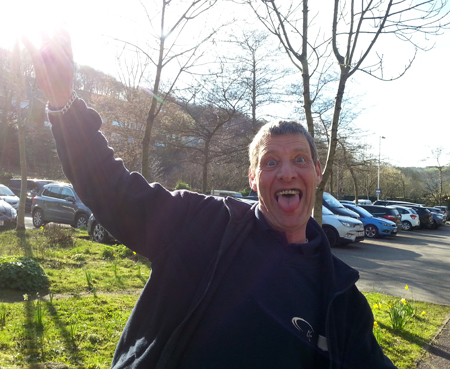 Friend, Judith Baron, of Hebden Bridge Camera Club took these two photos of our volunteer gardeners. 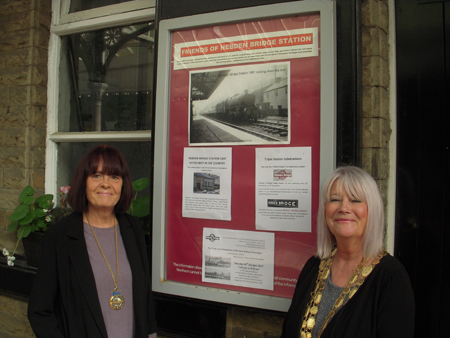 Friends of Hebden Bridge Station successfully applied to Hebden Royd Town Council for a small grant to enable them to mount an exhibition in the Town Hall about Hebden Bridge Station and signal box. With the help of Hebden Bridge Local History Society, the 19th century history has been well-researched, but there is still much to do on the 20th century. If anyone can provide any memories, photos, names of railway workers, details of events (preferably with some idea of dates), then please get in touch. We have names of some of the station masters who lived in the Station House, some of the workers who lived in the 2 cottages on platform 1, and some of the signalmen but it would be lovely to have more names and perhaps photos and tales from their descendants or friends. If you were involved in the fight to save the line in the 1980s, we would love to hear from you. 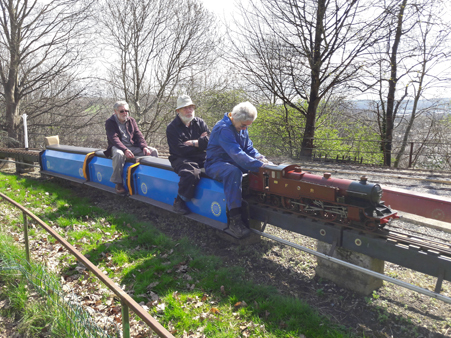 Thanks to Peter Jeffery, Friends of Hebden Bridge Station exchanged riding on large trains for smaller versions at Ravensprings Park which is a private park owned by the Brighouse and Halifax Model Engineers. 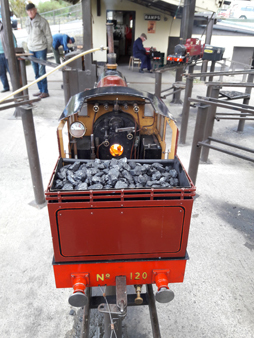 The park is open for public rides on selected Sundays (mainly the second), but the Friends were invited to go behind the scenes and have hands-on experience at raising steam and driving. Here are some photos. 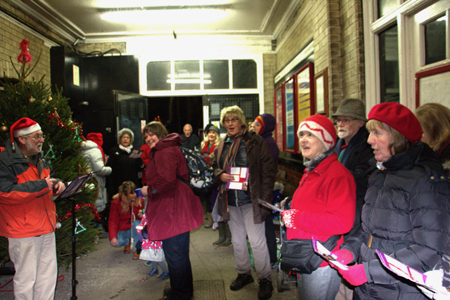 For many weeks at the coldest time of the year, the station waiting rooms were closed for refurbishment. 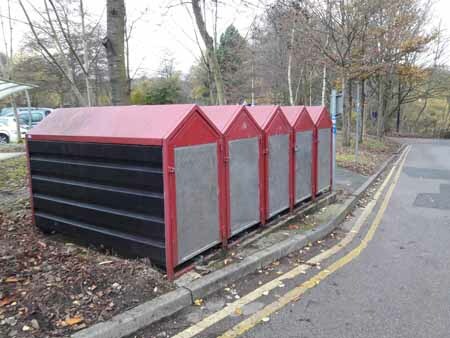 The wooden seats had been stored in a container and Friends of Hebden Bridge Station assumed they would be reinstated along with the exhibitions. Then the Friends were asked if we had any use for the old seats and standard metal seats appeared. 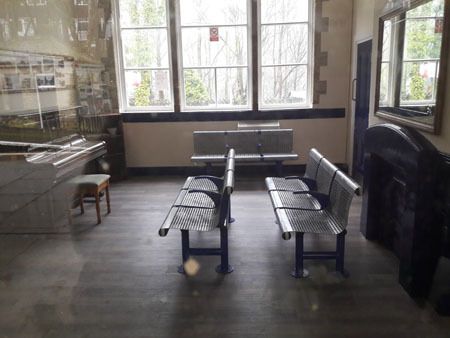 We suggested that the wooden seats should be put back because they were more in keeping with our listed station and, thankfully, this has now happened. The metal seats were put in position but not secured to the floor. Various new surfaces appeared. 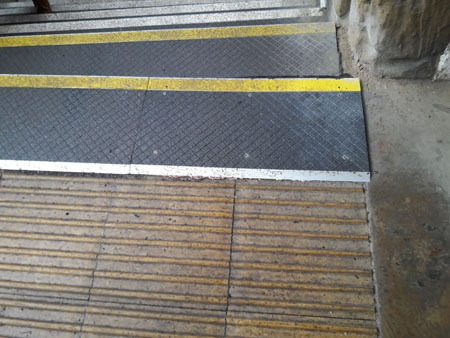 These were not in the original Network Rail planning application and, as stone ramp is specifically mentioned in the Grade II listing, it has been reinstated albeit with a number of drilled holes in the surface. 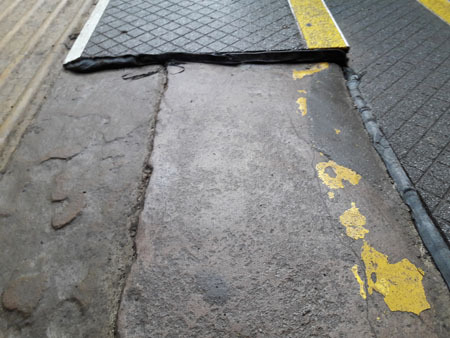 Sadly the request to uncover the stone steps has not happened but at least the trip hazard which was introduced, has been rectified. On Monday 12th March 2018 the Friends of Hebden Bridge Station and guests were given an overview of how horses worked on the railway, in an entertaining and informative talk by Peter Jeffery. On 21 February 1967, TV star Charlie shunted his own horse box onto the train at Newmarket, then was led into it. He had a sack of oats, a bunch of carrots and other treats for his journey to Frome in Somerset where he retired. 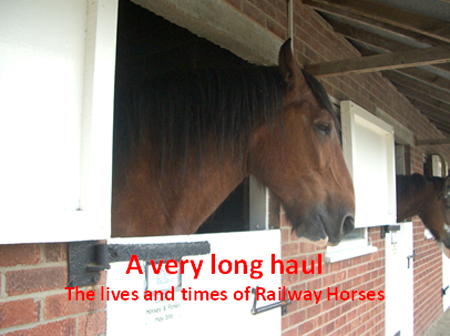 He was the last of his kind and ended “The Very Long Haul”, the history of the railway horse. Horses had been used at first for main line traction, as the first railways were intended to be horse-drawn, but became more important for shunting purposes and for conveying local goods to and from the station. The number of railway-owned horses reached a peak of nearly 28,000 in 1913, and some of the larger railway depots had three-storey stables, a horse hospital with horse ambulance, and employed teams of saddlers and farriers. A horse needed to be reshod about every 3 weeks, as the shoes wore out quickly on the hard roads. Signal Box planning application passed. 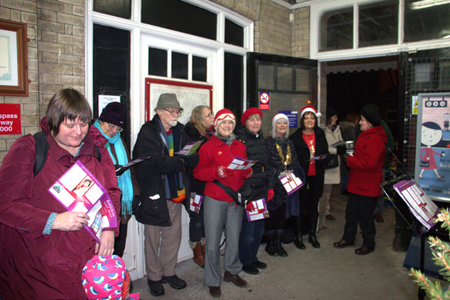 On a very cold Monday evening, (11th December), The Friends organised nearly two hours of carol singing to raise money for The Railway Children Charity. The charity helps street children at risk especially those who are found near railways in the UK, India and East Africa. The musicians, Heather and Diana with David conducting the "choir". 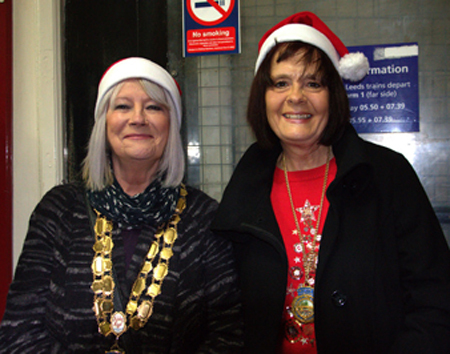 The mayor of Hebden Royd Town Council, Cllr Pat Fraser attended with her consort, Ellen Fellows. 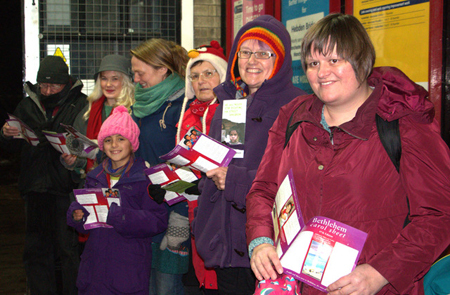 They had a lovely time singing their favourite carols. 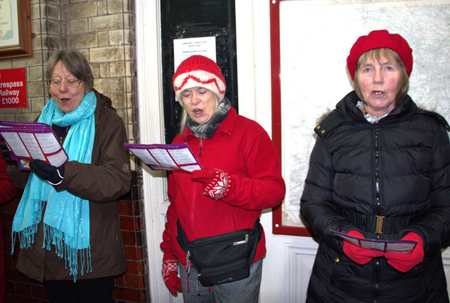 The singers were helped with a little parkin and hot drink which Thelma provided. The Friends put up and decorated the Christmas tree with the help of the nursery at the station. Snug homes for birds and bugs. 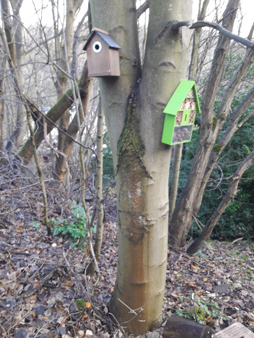 The Friends of Hebden Bridge Station have put up some more bird boxes bringing the total to seven. 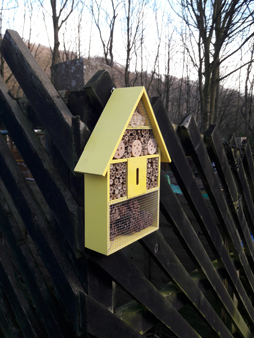 The Friends also hope the two new bug hotels will be welcomed now the weather is getting colder. One of the blocks of cycle lockers, strengthened to provide more security. 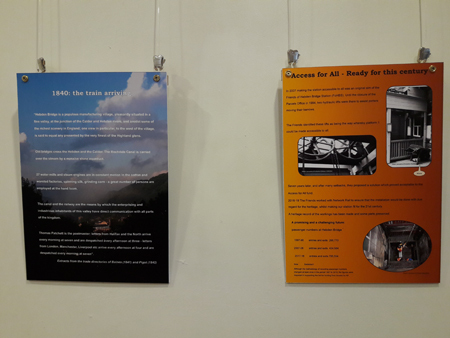 On Monday the 30th October, 2017 the Friends of Hebden Bridge Station hosted the third lecture in the series by Peter Jeffery, entitled ‘Trials and Tribulations of the Railway Passengers’. As in the previous lectures, Peter told us of problems faced by those pioneers, who had to invent solutions to these problems as they occurred, for never before had people seen powered mechanical transport, nor had anyone ever travelled so fast before. Peter explained how passenger carriages developed from horse-drawn carriages (for the first-class passenger) and from the coal wagon (for the unfortunate third-class). Well-illustrated by contemporary drawings and later photographs, we learned how third-class and first-class became a little closer in comfort and why second-class disappeared. Before the advent of restaurant cars, pioneered by the Midland Railway in 1874 with Pullman Carriages, long-distance trains would stop at intermediate stations so that passengers could buy food. 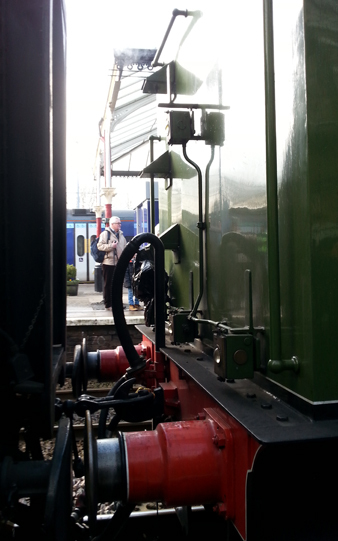 They also took "comfort brakes" as train lavatories didn't arrive until late Victorian times. Passenger comfort and convenience(s) were discussed and, as always, Peter laid great emphasis on the development of safe working of the trains. The diagrams and explanations from Peter had plenty of detail for the knowledgeable enthusiast, but were easy enough to follow for the lay listener to understand. 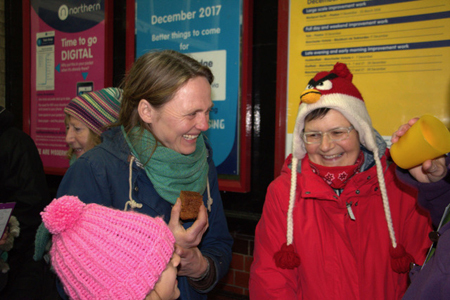 The Friends of Hebden Bridge Station held their 10th Anniversary celebration in the Parcel Bar Café at the station on Thursday 28th Sept 2017 at 11.00am. FoHBS was formed in 2007. 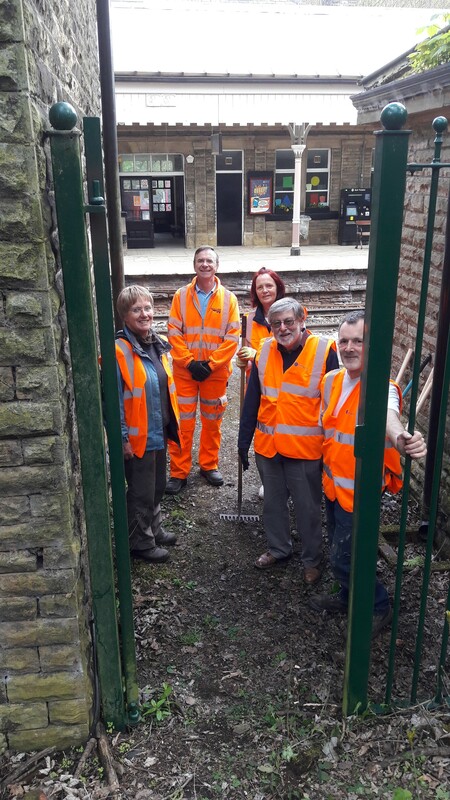 Our group takes an interest in the heritage of Hebden Bridge and safeguarding and enhancing the environment of the station and surrounding grounds. We promote the use of rail and other forms of sustainable transport, campaign for facilities for rail passengers and station users, and maintain the grounds. 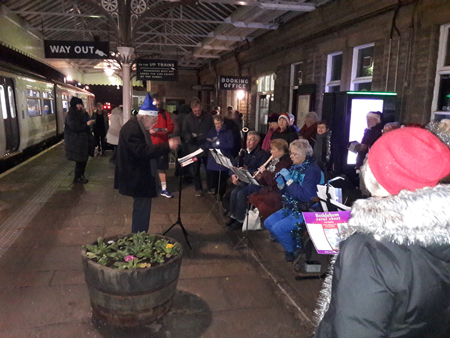 We also work with various community groups, the rail franchise holder, local businesses, and have contact with other station groups. By happy coincidence this date marked the publication by Penguin/Random House of Sir Simon Jenkins’ book ‘Britain’s 100 Best Railway Stations’. Hebden Bridge ‘particularly charmed’ the author. The third celebration was a pleasant surprise. See the separate article below. 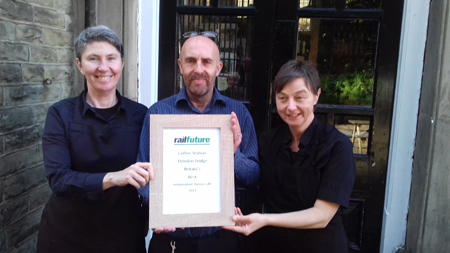 “The Coffee Station”, the cafe on Hebden Bridge railway station, is the first ever winner of a prestigious national award. The award is from Railfuture – the national rail passenger organisation that campaigns for better and more trains and a bigger and better railway. Station cafe customers across Britain were invited to vote on Railfuture’s website for their favourite independent station cafe. “The Coffee Station” beat other popular cafes from across the country and received over 500 votes from customers, over three times as many as the second place cafe (in Portsmouth, Hampshire); the Jubilee Refreshment Rooms at Sowerby Bridge came fourth. “The Coffee Station” was taken over in 2005 by Heptonstall residents Lisa Crebbin and Antoinette Hunt. It is open from 6am to 2pm Monday to Friday, and for slightly shorter hours on Saturdays. It serves hot and cold drinks, light lunches, all day hot snacks, home-made sandwiches and cakes, and also newspapers and greeting cards. Service is warm, friendly and efficient, and prices are very reasonable – a cup of tea is only 90 pence, a filter coffee £1. 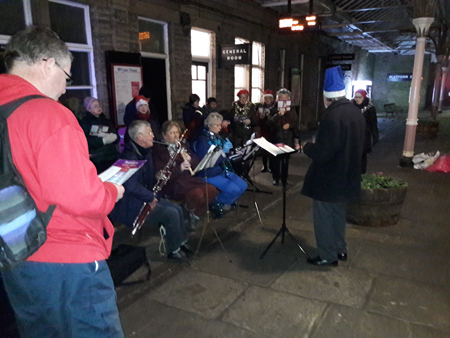 The award ceremony took place in the “Coffee Station” and was attended by the Mayor of Hebden Royd Councillor Pat Fraser, and Arriva Trains North’s Stakeholder Manager Pete Myers and Communities and Sustainability Manager Richard Isaac. Presenting the award, Railfuture’s Honorary National Communications Director and Board Member Christopher Hyomes from Pontefract congratulated Lisa and Antoinette for winning the award, and said they had beaten stiff competition from across the country. He said that good quality station cafes were greatly appreciated by passengers, especially regular commuters, and Railfuture had set up the award to encourage station cafes. 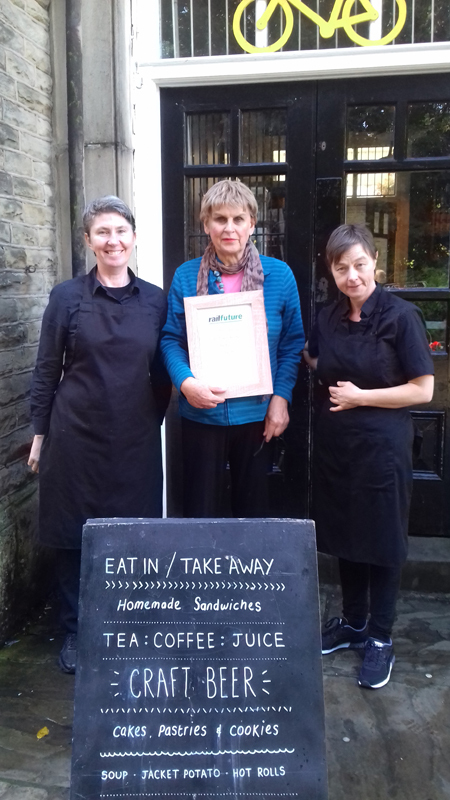 Lisa and Antoinette with Nina Smith, a Friend of Hebden bridge Station. 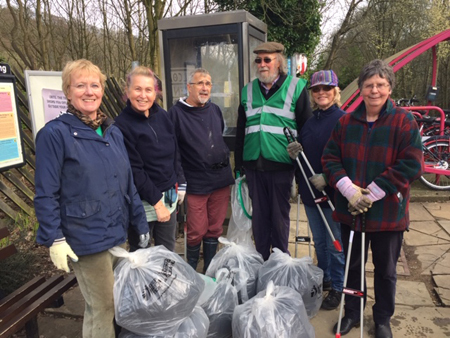 The Mayor of Hebden Royd, Councillor Pat Fraser, on the left, with one of her consorts standing by one of the noticeboards for Friends of Hebden Bridge Station..
Rubbish down railway bank alongside Pennine Housing flats: A working party organised by Trevor Bannister from Mytholmroyd and Northern Railway took place on Sunday 23rd April 2017 – four volunteers were assisted by Richard Isaac and another member of Northern’s staff. The area looks much tidier! 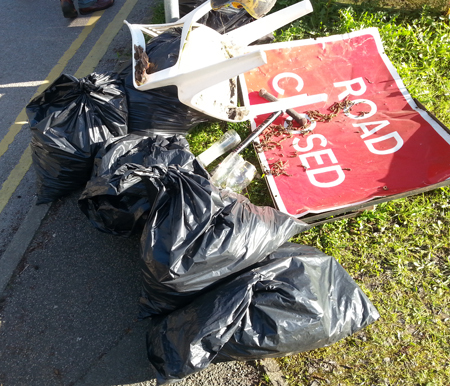 It is hoped that arrangements can be made to reduce the problem of litter here in the future. 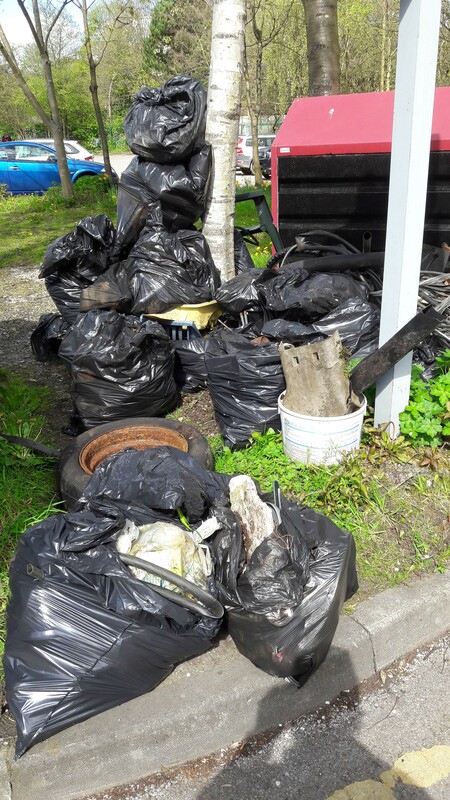 The bags of rubbish collected. We invited local poets to share a poem with us. 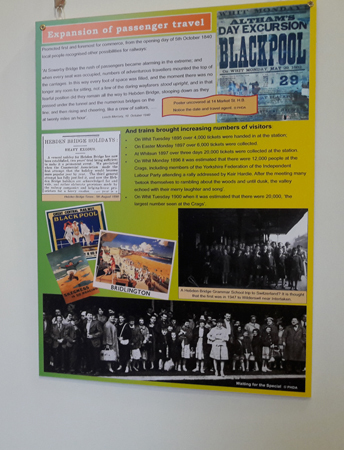 They can be read on our station noticeboards or are available below. 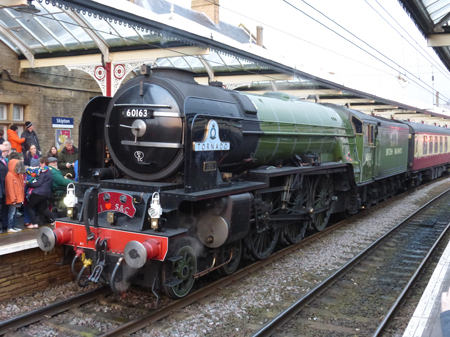 Latest poem: Platform 3 Lancaster Railway Station by Anne Etherington here. Station Cafe by Graham Ramsden here. Journey by Eileen Wright here. Travelling by train at half term by Anne Etherington here. Blue Flowers by Chrissie Bury here. She cannot weep by Moira Garland here. 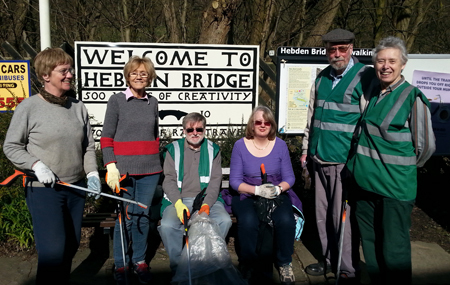 The Friends of Hebden Bridge Station hosted the second lecture in the series by Peter Jeffery. At this well-attended illustrated lecture, Peter told us of the problems faced by those pioneers, who had to invent solutions to problems as they went along. Never before had anyone seen powered mechanical transport, nor had anyone ever travelled so fast before. Some people even believed that it would be impossible to breathe when moving at such a speed. We were told that unfortunately the spur to action and invention was often an accident, such as the one Peter described where in September 1830 William Huskisson MP was struck by a locomotive at the Rainhill Locomotive Trials and later died. This led directly to the development of better brakes on trains. Peter explained and showed how on railways everything is designed to be fail-safe, from the brakes where the power is used to hold brakes off rather than to apply them, to signals which would fall to ‘danger’ if a control wire broke. What is a public railway? How should the wagons be pulled? 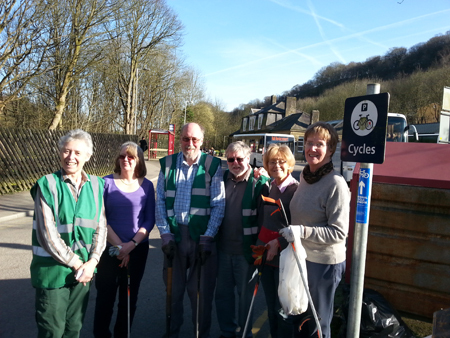 Lesley, David, Sue, Paul, Diana and Bobby carried out a litter pick around the station approaches. Here are the team gathered at the start. Still smiling at the end. The collected rubbish by the cycle lockers. 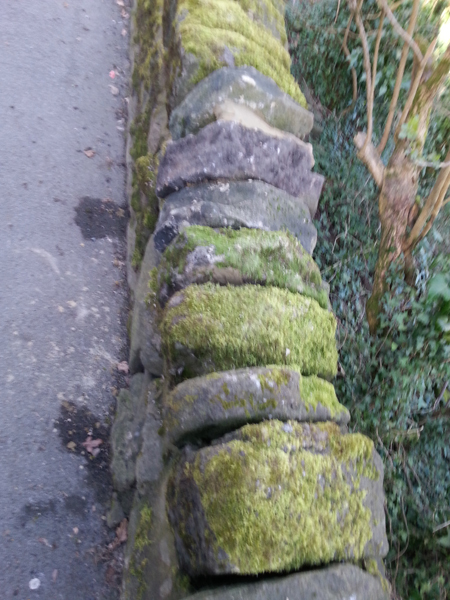 Whilst collecting litter from the allotment bank alongside Station Road, the missing coping stones were found so a repair was carried out. Brendan, a TLC driver, gave us some encouragement. 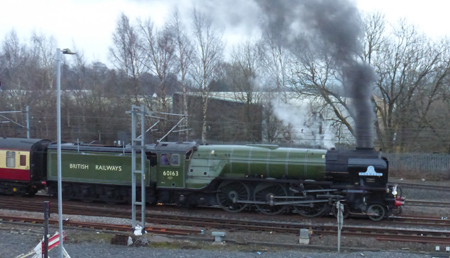 On 15th February 2017, some Friends of Hebden Bridge Station visited Skipton to see Tornado. Here are a few photos. (First three by Richard Sterry, last one by Diana Monahan). 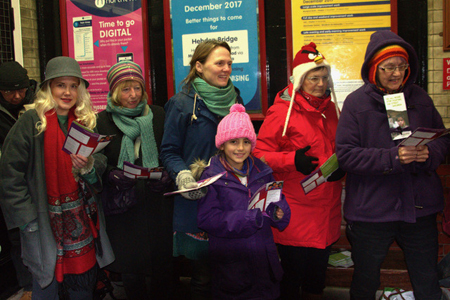 The Friends of Hebden Bridge Station would like to give a big “thank you” to the commuters for raising £117.86 for The Railway Children Charity. The charity helps street children at risk especially those who are found near railways in the UK, India and East Africa. 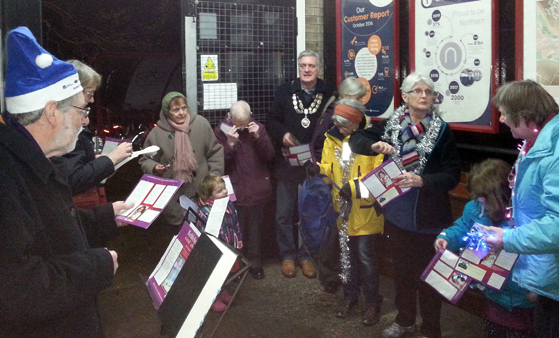 who were joined by the Mayor of Hebden Royd Town Council. 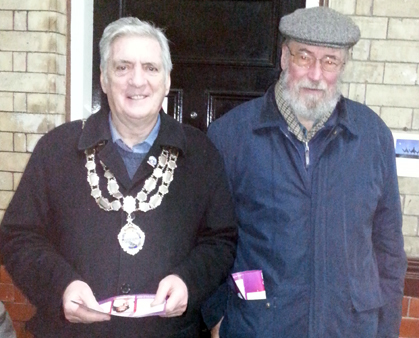 The current Mayor of Hebden Royd Town Council, Tony Hodgins, with the ex-mayor from 2000, Paul Monahan, who is a Friend of Hebden Bridge Station. As well as environmental work, the Friends are currently working with the railway organisations on plans for extending the car park and for making the station fully accessible. Contractors have been on site and carried out preliminary work on the lifts. The first stage was to dismantle parts of the existing goods lifts so that Network Rail’s contractors could carry out an assessment of the shafts, ready for passenger lifts. 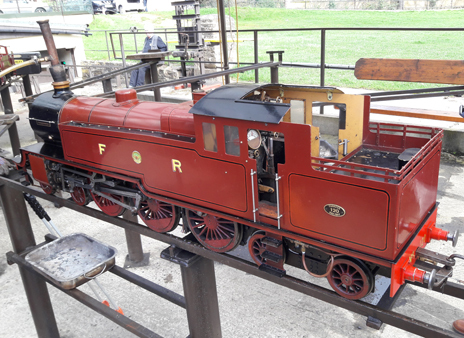 A full Rail Heritage report is being carried out and the best options for the conservation of the machinery considered. 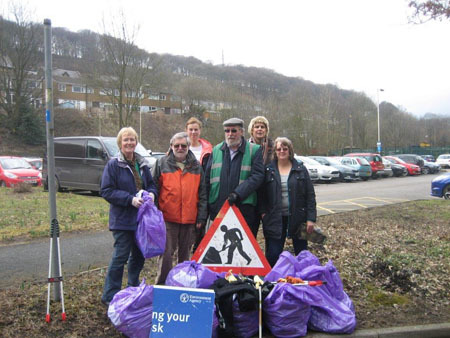 Plans for all the work necessary to make Hebden Bridge station fully step-free under the Access for All programme are expected to take another step forward in 2017 and Network Rail will be liaising with the Friends to take that forward. On 1 November 2016, just before the damp, cold weather came, three Friends spent several hours cleaning out the moss and leaves from the cycle lockers, wire-brushing them and finally painting the doors in silver hammerite and the back and sides in black hammerite. Sadly, due to the temperature dropping and the light failing the painting job wasn't completed and may have to wait until warmer, drier weather now. On 19th October 2016, The Friends of Hebden Bridge Station held what is hoped to be the first in a series of lectures on railway topics, in Hope Baptist chapel. For our inaugural talk, we heard from Peter Jeffrey, whose interest in railways has spanned many years. His enthusiasm is such that he is building his own working model steam locomotive! 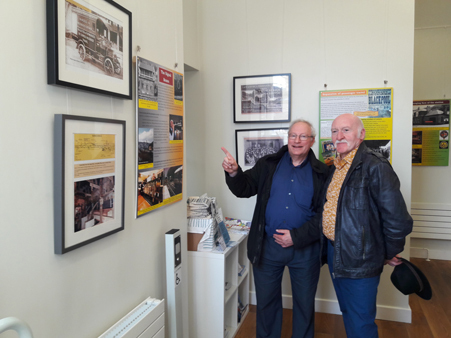 Peter’s talk, “The Trials and Tribulations of the Railway Pioneers”, was well-presented and included information to interest both the enthusiast and the newcomer alike. Peter led us from the early difficulties faced by Richard Trevithick, who Peter regards as the true ‘father of railways’, through the byways of rack railways to the Stephensons, father and son, and then to Brunel and his ‘Battle of the Gauges’. Peter showed how the difficulties ranged from public and private opposition especially some uncooperative landowners, to broken rails, and to the need for more steam power. Response to the DfT and Rail North Consultation on the Northern Rail and Trans Pennine Express Franchises.